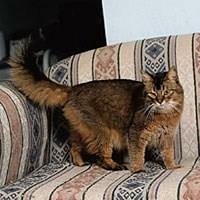 The Somali is a graceful, athletic and well muscled cat of medium size with a beautiful coat and bushy fox like tail. The Somali requires regular grooming to stay looking at its best, but the silky textured coat is less likely to matt than that of the Persian. A semi-longhaired cat, the Somali comes in four basic colours of cinnamon (sorrel), tawny, blue and beige-fawn with these four colours also in the silver range. Each hair has many bands of black or chocolate brown ticking which takes quite a long while to develop fully. Kittens are born with a dark coloured coat that will become fully ticked at about 18 months of age. They are attractive fun loving cats with big almond shaped eyes that are very expressive. Even tempered and a great companion for children, these playful, athletic cats are very curious and enjoy the company of people. Generally they have a soft, quiet voice which they don't use a great deal.